OhMyVera! 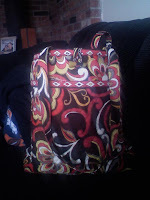 A blog about all things Vera Bradley: Sarah's knitting bag! My friend Sarah sent me a picture of her knitting bag, which happens to be a Puccini Tote! Happy knitting!